DVD Synopsis: A beautiful woman is terrorized by calls from an ex-lover who has escaped prison for the pleasure of killing her... a family becomes a feeding ground when their father returns home wounded after ridding the countryside of a hideous vampire... a nurse is haunted by reproaches from the Beyond after stealing a ring from the finger of a dead medium! Join Boris Karloff as he hosts (and stars in) this trilogy of terror tales, with every shock intact! Before taking his seat in the director’s chair, Mario Bava first followed in the footsteps of his father, Eugenia, a well-respected cinematographer in the early days of Italian cinema. 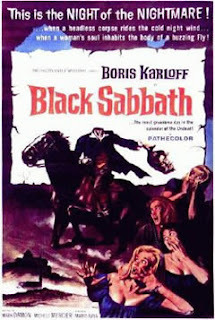 In watching Black Sabbath, you'll see that the junior Bava's days spent looking through the viewfinder were not in vain. Aside from his clever use of framing (In the segment The Telephone, the various shots of the phone itself, whether in close-up or positioned in the background, bring a level of real terror to a common, everyday item), Bava also gives his camera free range; it's as if it's gliding, in bold, smooth motions, throughout the entire film. As the final segment, titled The Wurdulak, opens, we're following along with one of the characters, whose riding across the landscape on a horse. But the camera doesn't stop when he does; it continues on past this character, and in so doing cleverly reveals that there's someone else hiding in the shadows, watching this rider's every move. By presenting this scene, and every other in Black Sabbath, with such eye-catching flair, Bava pretty much guarantees that his audience will squirm in all the right places. It has taken me years to watch this film in its entirety. About 10 years ago I saw the first 30 minutes of it. Then some emergency happened and I had to run out of the house. A year ago, I finally got to see it again. It is a wonderful story. A bit slow for modern movie goers, but it holds your attention. @Mari: Yeah, it might be a little slow for people used to modern, fast-paced films, but the 3 stories are all interesting enough to keep your attention. Thanks for the comments! They are appreciated.